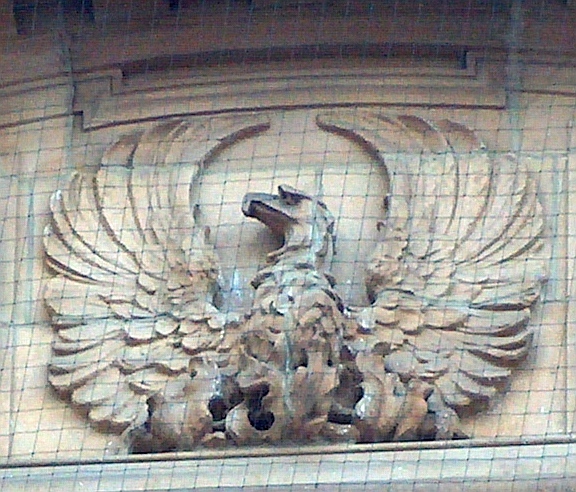 Phoenix, King Street, London . There are a modest number of phoenix sculptures in England, not a popular mythological subject for the sculptor, but not as rare as the mythical phoenix is reputed to be. 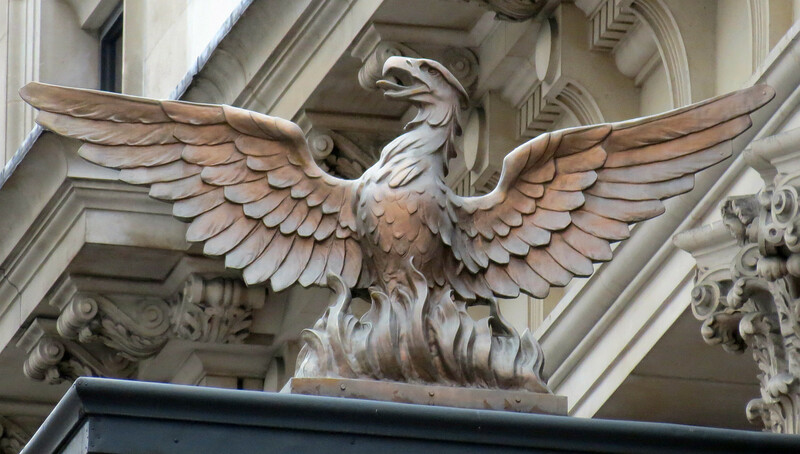 The phoenix was taken as the symbol of a major insurance company, the Phoenix Life Assurance Company, and their former headquarters building in King Street, London, has a large Phoenix statue on top of its clock, which projects out over the street below. 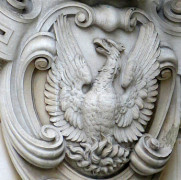 It shows the characteristic features of the Phoenix found in most statues of the bird: it has the look of an eagle, fierce in aspect, typically beak open and tongue protruding, as if crying out in some shrill voice. It stands among flames, gathered together in some small pyre rather than more extensive, and rarely reaching above the short legs of the phoenix, which are generally entirely covered by flames. The wings are spread fully open, not particularly as if the bird was about to take wing, but more as if spread to catch the heat of the flames, to bask in their glow. 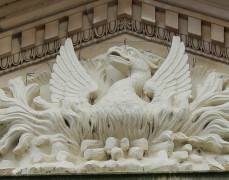 Here are a few examples of phoenix statues I have come across in the same vein – they really are rather similar in type. 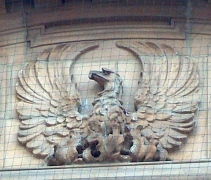 The one above centre is perhaps the largest Phoenix sculpture, very high up on St Paul’s Cathedral. 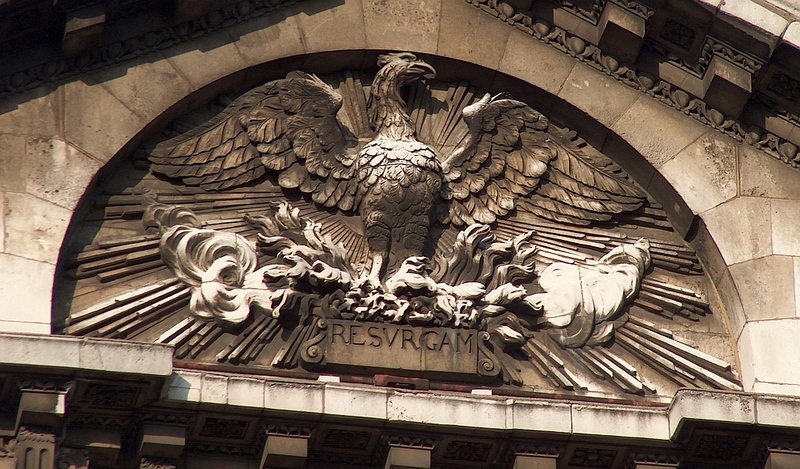 Here the Phoenix, with the Latin word ‘Resurgam’ expresses the idea of the Phoenix reborn from the flames rather than simply immune to fire. 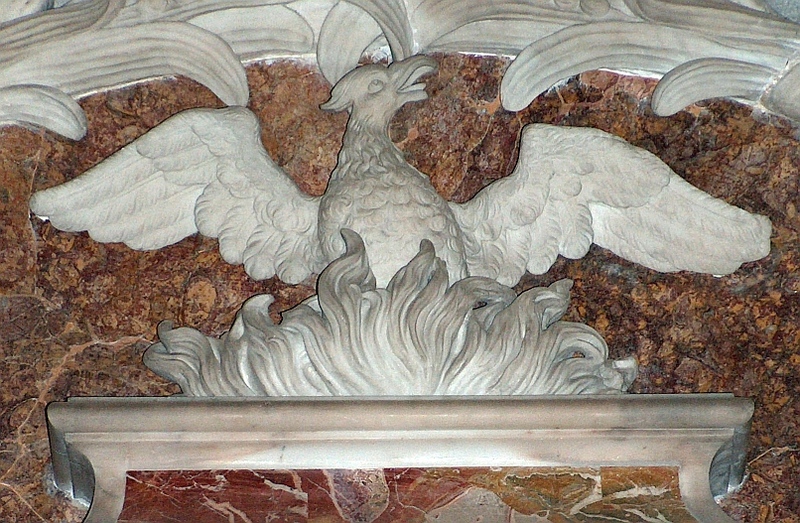 But this use is rare – above right is an example from a church monument – and religious uses of the Phoenix generally seem extremely unusual. 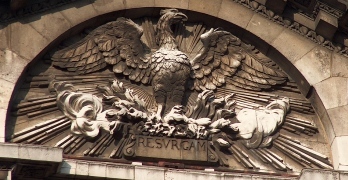 The Phoenixes above are a variant from the usual type. The three towards the left has the wings bending up and over, again suggesting basking in the flames, but certainly a different pose. The one on the right, forming the extended keystone above an arch, has a different head from the usual type, less eagle and more Griffinlike; the griffin’s head is based on the eagle, but is more solid and heavy in the neck. 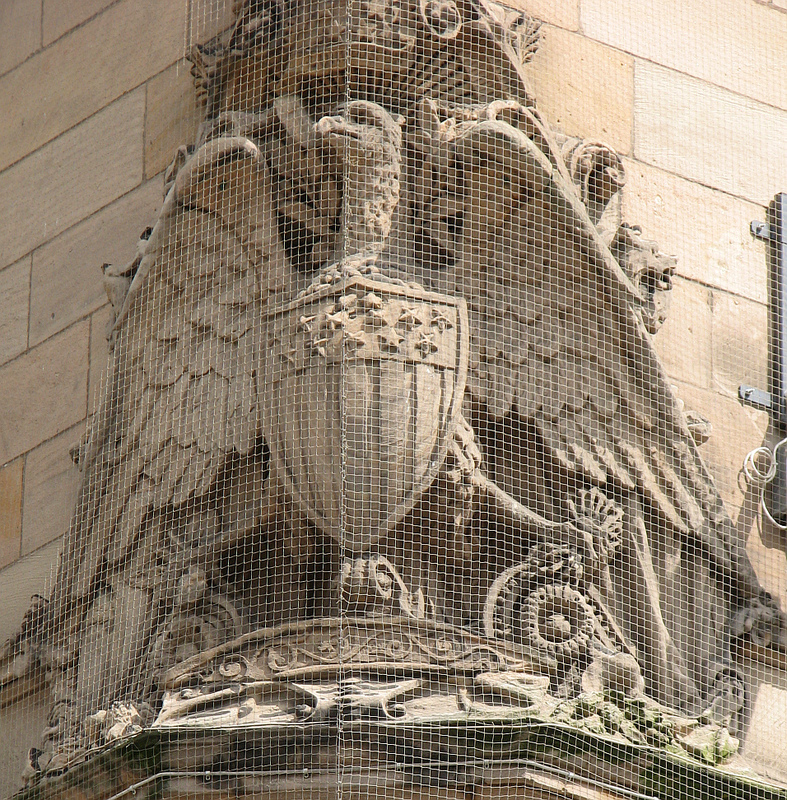 Some things which look like Phoenix statues are probably not. 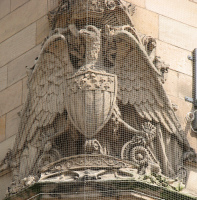 Books and casual observers sometimes describe a bird as a Phoenix, such as the case above left, which on inspection has no flames, and may be simply an eagle (see this page for eagles). 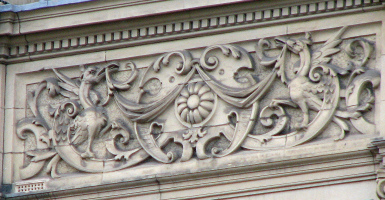 Or (above right) a particular type of grotesque bird (i.e. 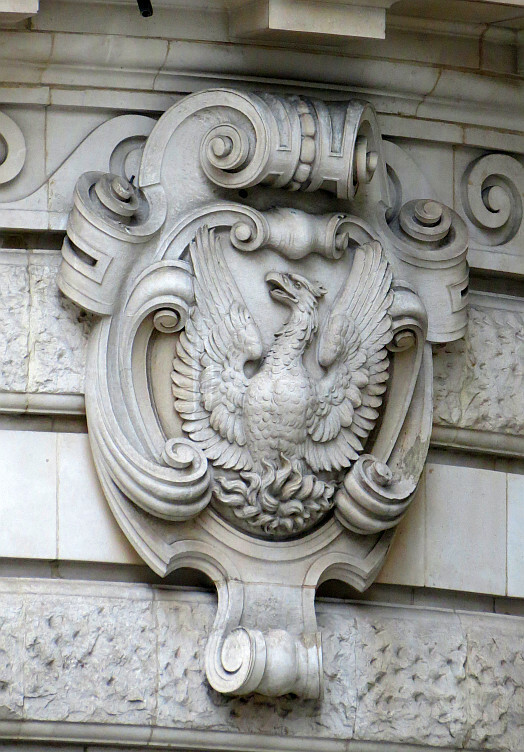 one whose body shape has been arranged more for decorative purposes than an attempt to be anatomically correct) is sometimes described as a Phoenix, with no particular reason why. But it is tempting and I have occasionally noted down such things as Phoenixes myself – but cannot analyse why they have that feel about them. Finally, I thought that given the large proportion of the Phoenix sculptures we have are due to the Phoenix Fire Office, it would only be reasonable to include a picture of some memento to that organisation. 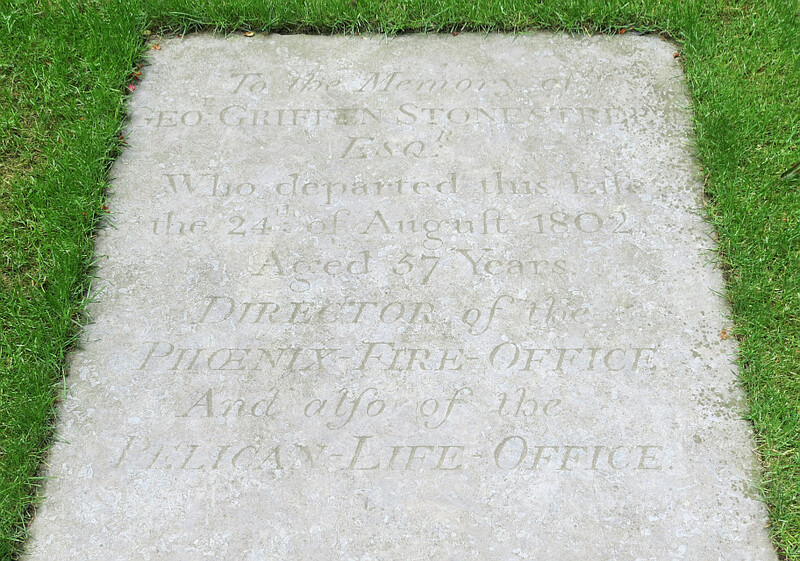 Here then is the gravestone of George Griffen Stonestreet, Esq, d.1802, Director of the Phoenix Fire Office (and also of the Pelican Life Office) - you will need to click to enlarge to read it. Mr Stonestreet, Director of the Phoenix memorial .